(Nanowerk News) Money may not grow on trees, but trees themselves and all that they provide have a dollar value nonetheless. At least, that’s the view of those seeking to quantify the myriad ways humankind benefits from nature’s ecosystem services: clean air and water, food, even paper from trees. But it’s complicated. What financial value should be ascribed to, say, plants that improve water quality or wetlands that reduce flooding and property damage from storms? Many ecology and conservation organizations advocate for making such determinations in the interest of land management. Conservation biologists, meanwhile, argue that putting a price tag on nature could weaken the protection of threatened species that have a lower dollar value. Therein lies the core issue in the debate: To what degree will biodiversity be protected by managing for ecosystem services? 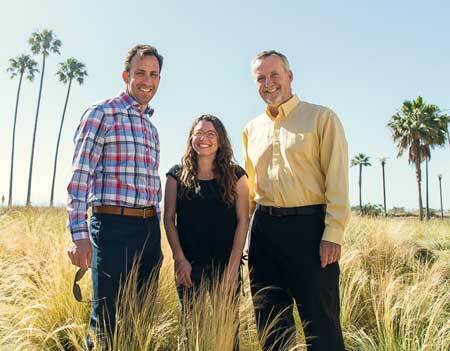 To address this question, a team of UC Santa Barbara researchers has developed a new modeling framework that blends a novel mix of ecology and economics. Their findings appear in the journal Ecology Letters ("To what extent can ecosystem services motivate protecting biodiversity?"). From left: Christopher Costello, Laura Dee and Steve Gaines. “We sought to assess the likely consequences of growing efforts to manage for the economic benefits of ecosystems rather than protecting species for their intrinsic value,” explained co-author Steve Gaines, dean of UCSB’s Bren School of Environmental Science & Management. Because nature is so complex, scientists rarely know the roles all species play in providing benefits to people. This uncertainty is magnified by the fact that the environment is changing. Not all species contribute to ecosystem services, yet critical ones could be lost without conservation. And scientists don’t know for sure which species are critical. The team’s framework generates simple criteria for determining how much the value of the service must exceed the costs of management to financially justify protecting all species. This defines the settings whereby protecting all species is the economically optimal choice. The group examined this criterion for six different services and ecosystems, ranging from the pollination of watermelon to carbon storage along coastlines or in tropical dry forests. In some cases, protecting all species in an ecosystem is financially motivated. In others, management solely for financial benefits may leave many species at risk.